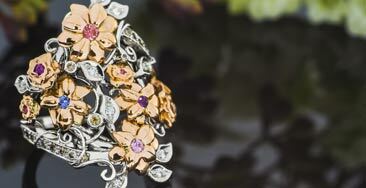 It's been said that for Color Gems, the 4 C's are Color, Color, Color and Color! Green Lake maintains one of the largest collections of ethically sourced colored gems in the country, many direct from mines and cut right here in the workshop. 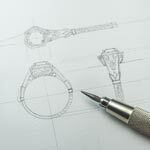 When designing an engagement ring or wedding band from scratch, the options for gemstones abound. 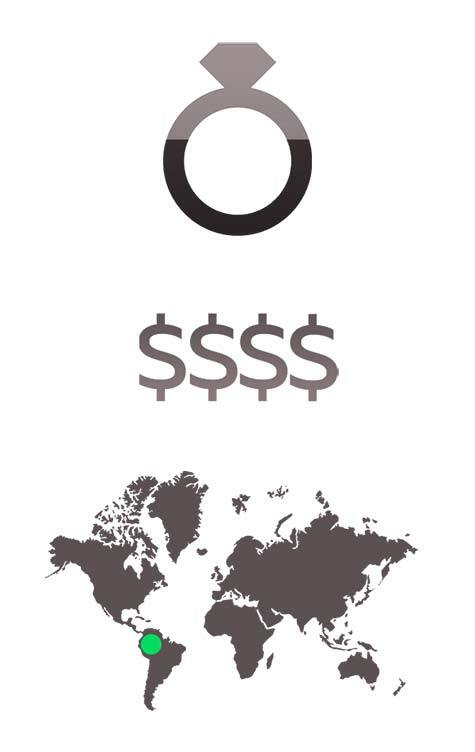 Key factors to consider when deciding on which gems to use are how you’d like the piece to look, how it will be worn - and of course the amount you’re prepared to invest in it. 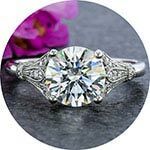 This page will help familiarize you with the many options available, from the most popular sapphires to exotic gems and cuts you may be learning about for the first time. 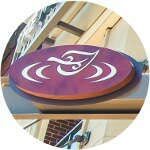 Be sure to Ask a Designer and use our Gemstone Search to find the gem that’s best for you! 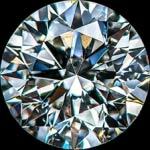 For most people, the color of their center stone is paramount. While there are many gems we associate with a specific color, natural sapphires occur naturally in a myriad of hues beyond just the familiar blue. 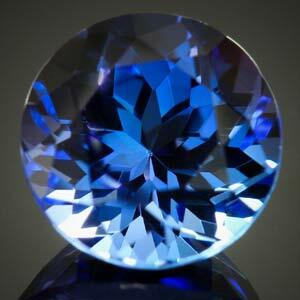 In addition, sapphire are one of the the most durable precious gems of all. 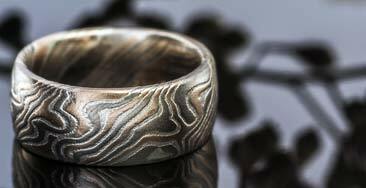 Natural gemstones are each unique, so specific colors may not be immediately available in every shape & cut (and vice versa). 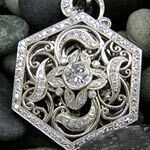 Gems can be cut, or faceted, in a variety of ways depending on the shape, color saturation and how much fire and sparkle is desired. Many color gems are cut to maximize weight, especially those cut in thailand, while we prefer to optimize the overall appearance of each individual gemstone. 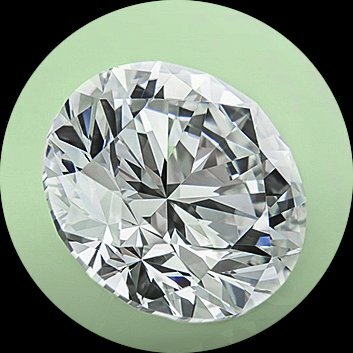 Some cutting styles will make a gem appear darker because faceting effects color, not every color is possible in every cut style. 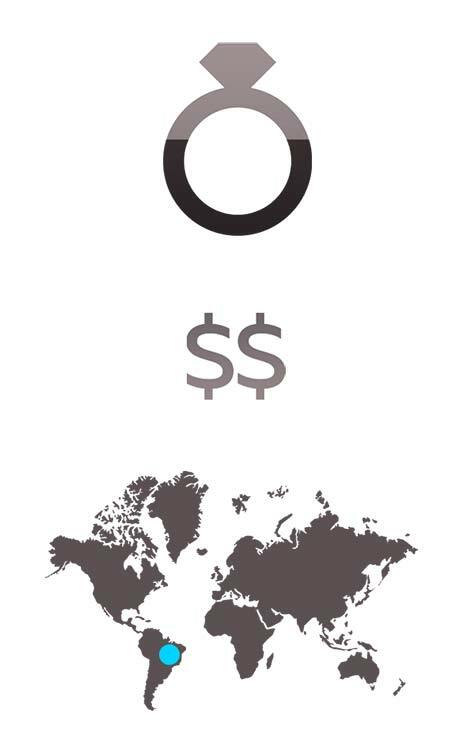 The world of gemology is vast; with an array of obscure minerals and rare gems. 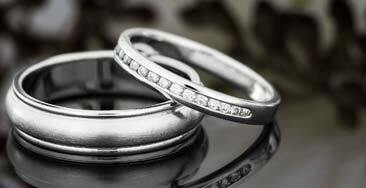 For wedding rings, we suggest using super hard materials that won’t easily chip or break and assure a lifetime of confident wear such as Diamond or Sapphire. 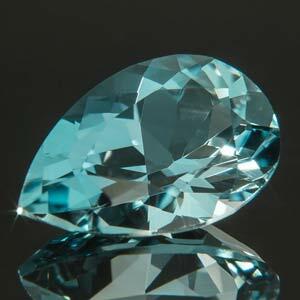 Further down the scale are beryls, such as aquamarine and emerald. 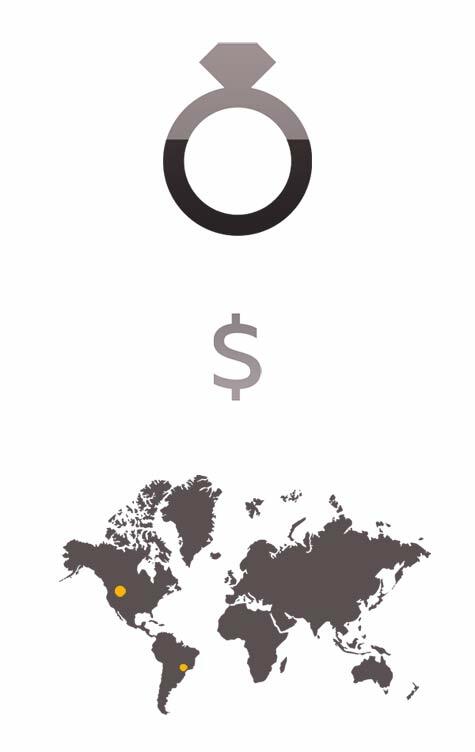 Green Lake's lab-created gemstones are grown using advanced technology, (most often the Flux-fusion process) creating beautiful lab-created gemstones. 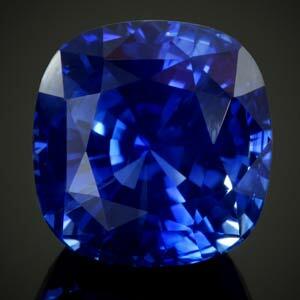 These techniques produce real sapphires & other gemstones with the same physical, optical and chemical make-up as natural gemstones. 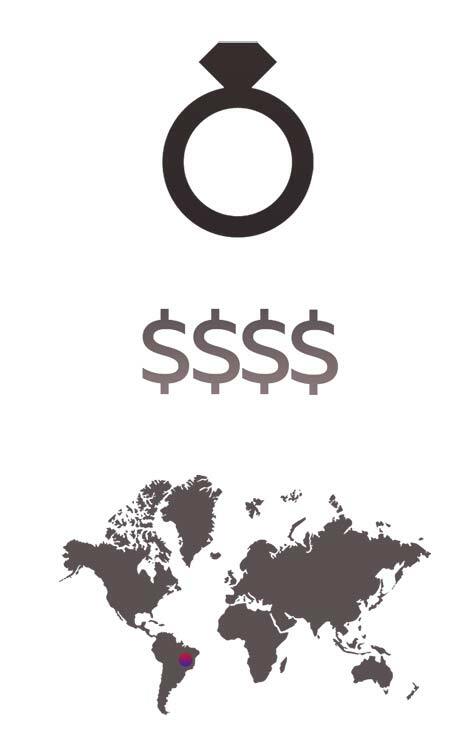 Hardness, refractive index & dispersion are all the same as the natural counterpart. 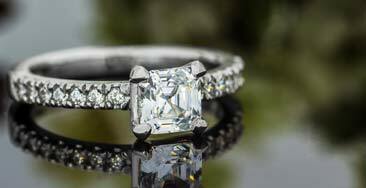 Lab grown gemstones are like ice made in an icemaker instead of naturally frozen in a lake. Under the right conditions, gem crystals, like ice cubes, will form. The freezer ice or lab grown gem will be cleaner and more perfect than lake ice or most mined gemstones because you control the environment & remove imperfections. 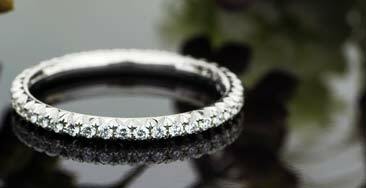 But ice cubes are still ice and lab grown sapphires are still sapphires, just like those that form in nature. 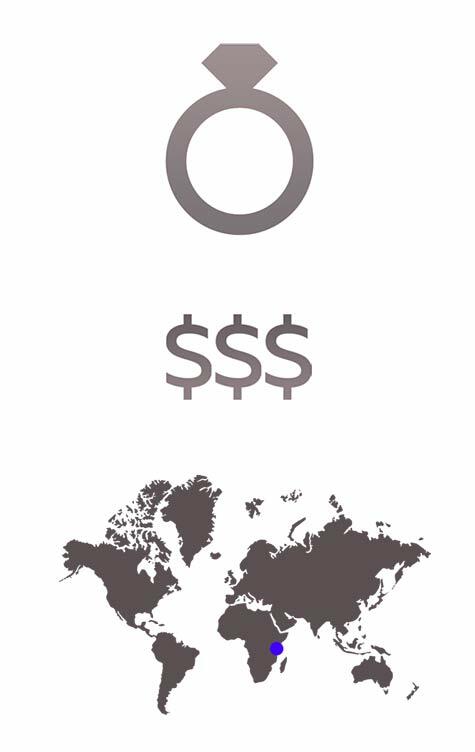 This also means that Lab Grown Gemsstones are created using fewer resources than traditional mining and with a low carbon footprint. A staple of royal jewelry throughout the ages, sapphires actually preceded diamonds as the go-to center stone for engagement rings, at least until diamond availability boomed with the discovery of new mines in the 20th century. 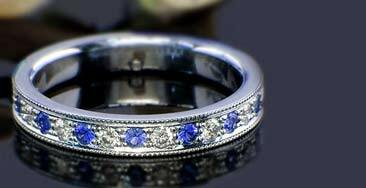 Not only treasured for their well known deep blue hues, sapphires are ideal for wedding jewelry because their hardness is also second only to diamond. 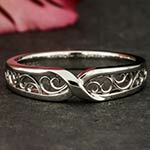 This means sapphires as easily won’t crack, chip, dull or wear over the life of a ring. 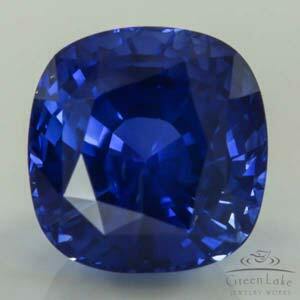 Blue isn’t the only sapphire color either, as they come in all shades except red (which is actually ruby!). 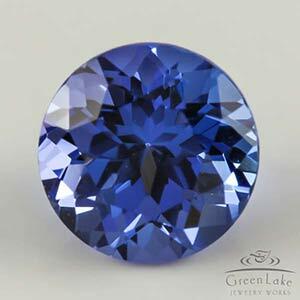 Buying Tip: In addition to the loose and rough sapphires of all colors in our Gemstone Search, Green Lake maintains one of the world’s largest online galleries of American sapphires in our Montana Collection. 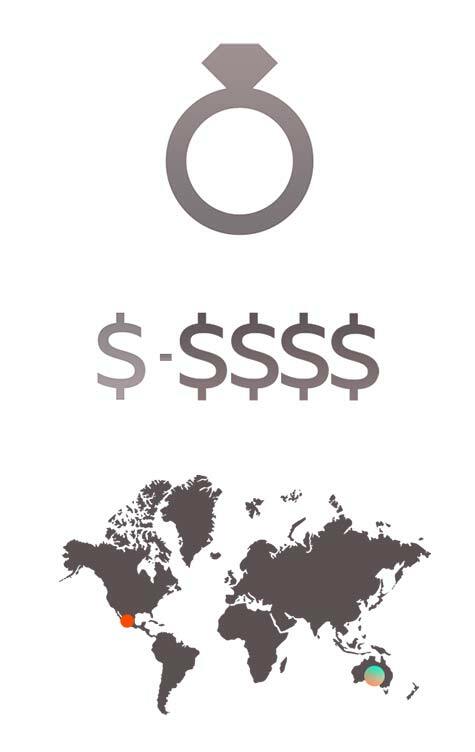 Price per carat, ruby is the most valued of any or the popular colored gemstone. 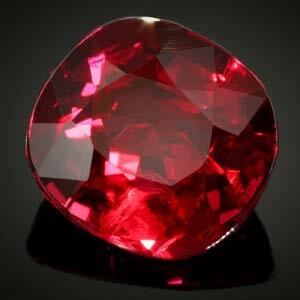 Like sapphire, ruby is the mineral corundum and its color can range from glimmery fuchsia to deep, formidable red. 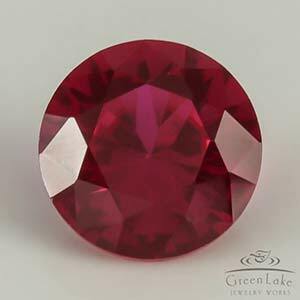 For corundum to be especially red however it’s also typically included – those natural hairline cracks in a gem that can cloud its appearance – so with ruby, color often trumps clarity. 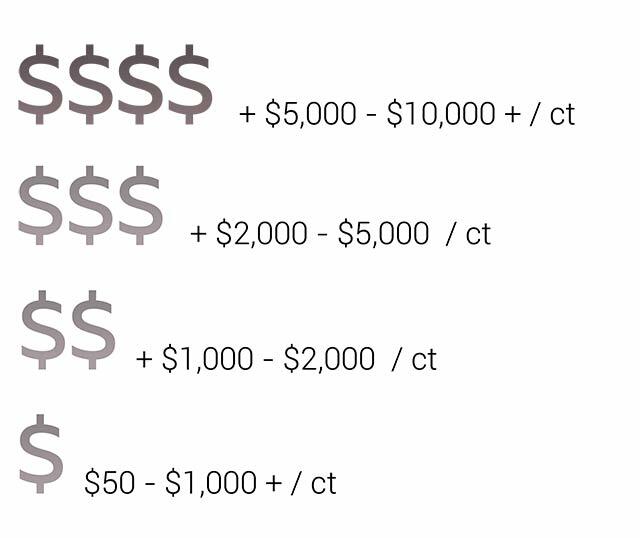 Buying Tip: There are many treatments applied to rubies in the market that aren’t exactly on the up and up (e.g. glass filling cracks or dying for temporary color), so be sure to work with a reputable gem dealer for rubies to be used in engagement rings or wedding bands. From Ancient Egypt to Art Deco, jewelers have made rare emerald a centerpiece, solidifying in our minds a gem of opulence and fortune. 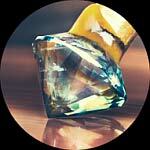 It even has its own cut named for it, with precise steps and facets that accentuate the gem's uniquely long prisms. 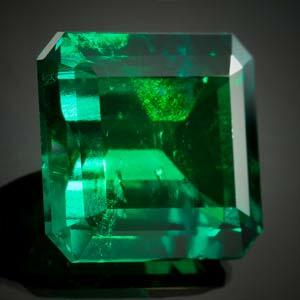 Emerald also sports its very own kind of green, a cool hue unmatched by any other gem. What emerald doesn’t provide however is a whole lot of strength. 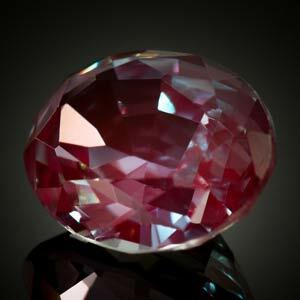 This gem is not only softer than sapphire and ruby, but oftentimes heavily included as well, making it an particularly expensive yet fragile gem for daily wear. 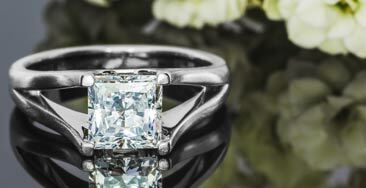 Buying Tip: There are a lot of creative options available to setting emeralds, as well as sourcing the right size and cut – done right, an emerald ring can be a stand-alone heirloom. Named for Tsar Alexander II, alexandrite was originally discovered Russia’s Ural Mountains but today is mined largely from deposits in Brazil. 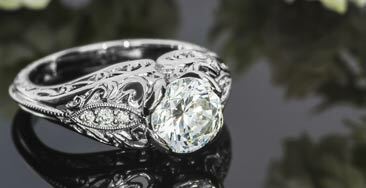 It remains as one of the rarest, most elusive - and subsequently most expensive - price-per-carat natural gemstones on Earth. 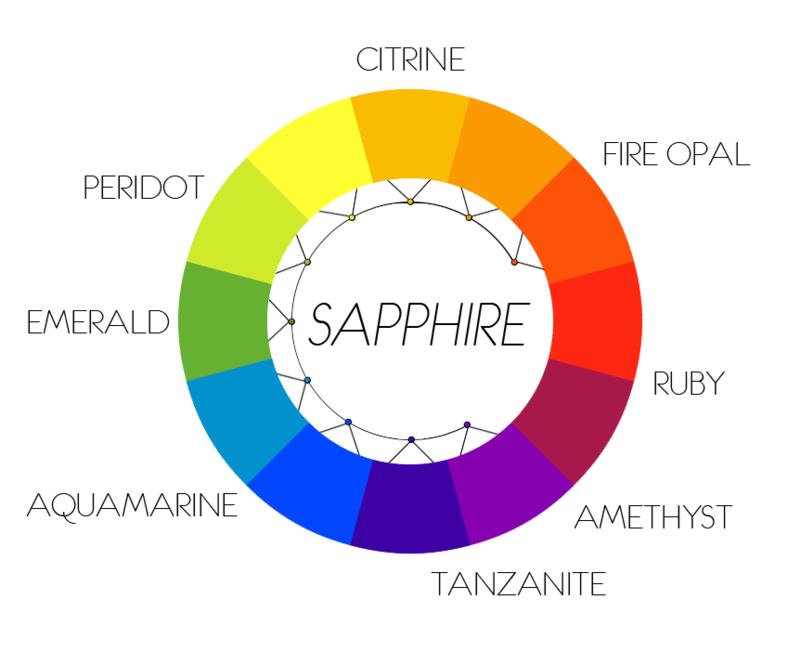 Its color can change from green to teal to magenta to indigo all depending on the angle or light in which it’s perceived. 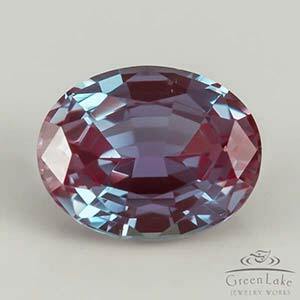 Buying Tip: Second to synthetically-grown diamond, lab-grown options for alexandrite are greatly popular alternatives for many to incorporate a clean gem at a reasonable cost. 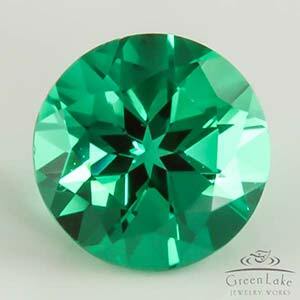 When the mineral beryl that provides for emerald crosses from green to blue, it becomes aquamarine. 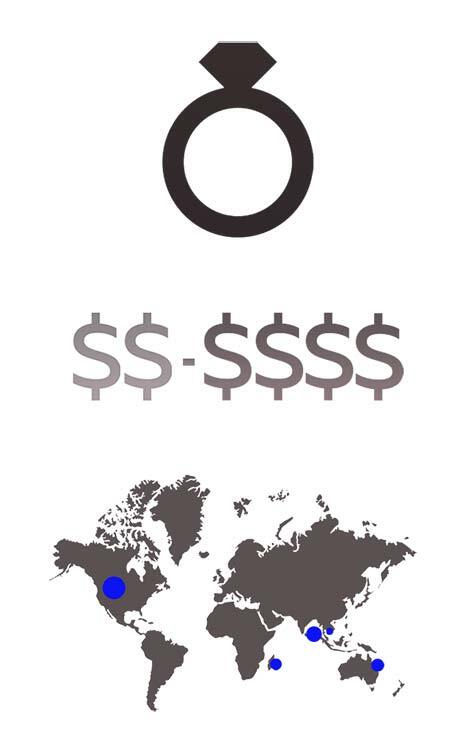 As a cousin, these gems are also found in many similar regions of the world. 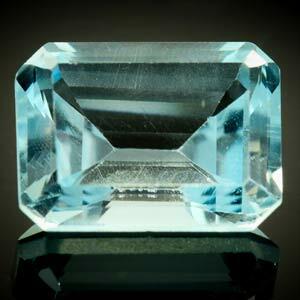 Unlike emerald however, aquamarine is generally free of significant inclusions, making it a gem that appears cleaner to the eye and more durable for daily wear. Buying Tip: Aquamarine can be so crystal clear to the eye that some unscrupulous dealers, mainly abroad, have gotten away with selling polished glass in its place! 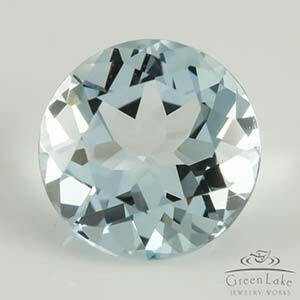 Buy loose aquamarine with a reputable shop that can confirm its genuine beryl. 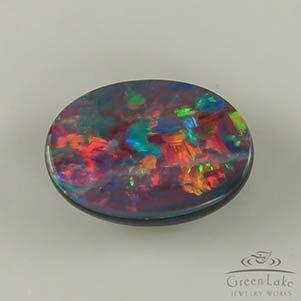 Opal provides for a wild variety of color and a broad range of cost, from the vivacious orange of a Mexican fire opal to the shimmering iridescence of a black opal from Australia’s Lightning Ridge. If at first glance opals appear almost fluid in nature, it’s because unlike any other gem they contain 3-20% water. 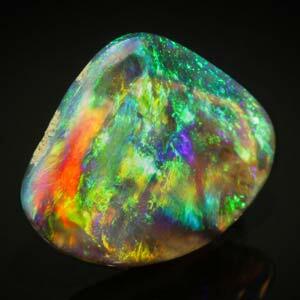 This can make most opal a soft and brittle gem that’s easily susceptible to breakage. 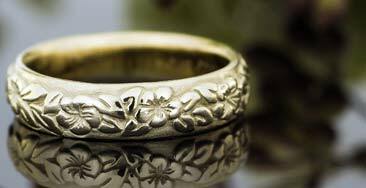 Buying Tip: For engagement rings and wedding bands, opal should be set with as much protection as possible, knowing there’s still a chance the gem may one day need replacing. Discovered in Tanzania in 1967 and named by Tiffany & Co, Tanzanite has become an increasingly popular gem on account of its deeply saturated color. Considered a ‘trichroic’ gem, most Tanzanite will display three layers of color, from rich blue to velvety purple with subtle flashes of red. Indeed the striking color of this gem has captivated the attention of the jewelry world, but it’s also a rather delicate gem known to shatter under just moderate heat from steam cleaning or a torch. 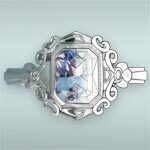 Buying Tip: We always advise custom ring clients keen on the color of Tanzanite that it’s especially fragile gem too. 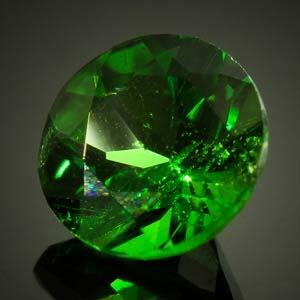 Far rarer than a red garnet, the glowing green Tsavorite garnet was discovered relatively recently in 1967 near Tsavo, a remote region in Kenya famous for its abundant wildlife. 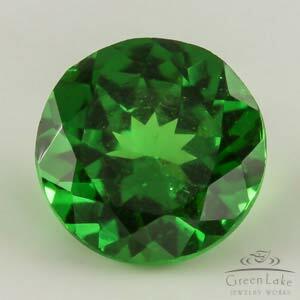 Tsavorite is widely considered to be an underrated gemstone in that it boasts a color similar to that of emerald and is nearly as hard, yet lacks the inclusions that make emerald so fragile. 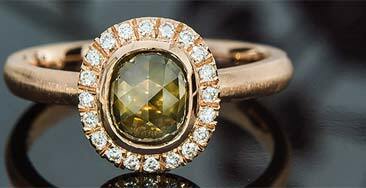 What’s more, Tsavorite is far less expensive than emerald – unless the gem is larger than 2cts in which case the value skyrockets as it finding Tsavorite that large is especially uncommon. Buying Tip: Using Tsavorite as a green side-stone alternative to emeralds captures a similar look, and little more sparkle too. 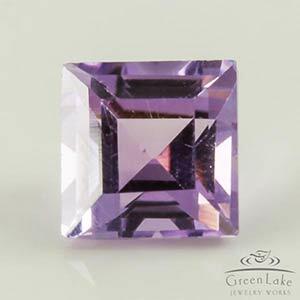 Perhaps the most popular variety of quartz used in fine jewelry is amethyst, which exhibits a rich violet hue that’s especially appealing to those interested specifically in owning a purple center stone. Amethyst is also typically free of inclusions, making it a gem that appears clean and clear. 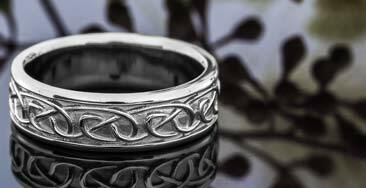 What amethyst is not however is especially durable, so we advise its use largely for accents and accessories. 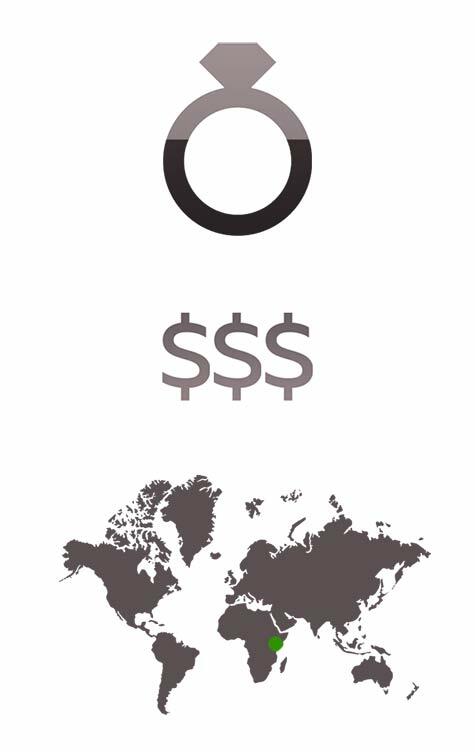 Buying Tip: Because amethyst exhibits such beautiful color at such a reasonable cost, high carat centers can provide for a serious right-hand bauble. 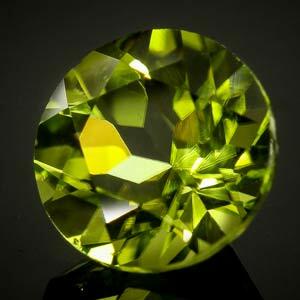 Found in ancient lava flows – and even on occasion in extraterrestrial sources like meteorites – peridot shimmers with an otherworldly yellowish-green. 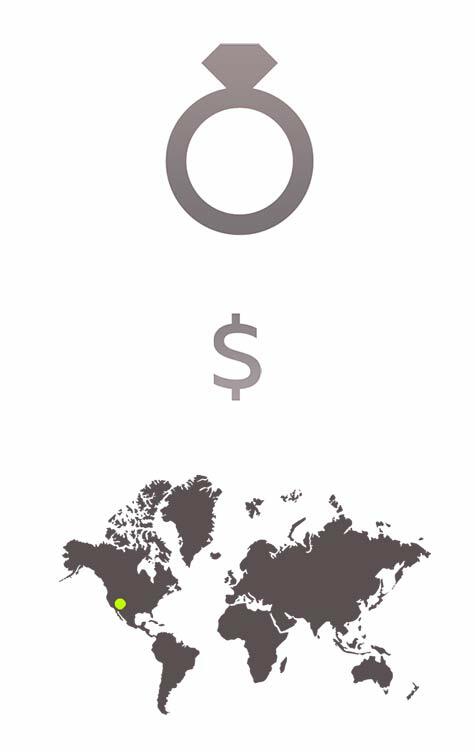 Peridot lends itself to a wide range of cuts and higher carat weights that are generally available at a more modest cost that other green gems. Though originally sourced from ancient mines along the Red Sea, the gem can also be found closer by and is the namesake of Peridot, Arizona. 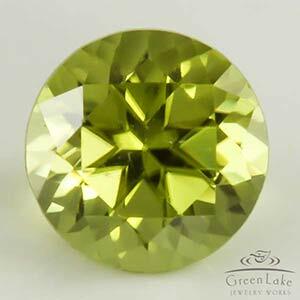 Buying Tip: While most peridot is slightly yellow, a true grass-green color fetches the most value. 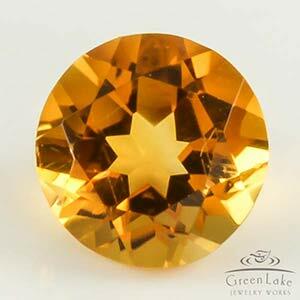 Rarer than its Amethyst cousin, Citrine is a quartz that ranges from pale yellow to reddish orange. 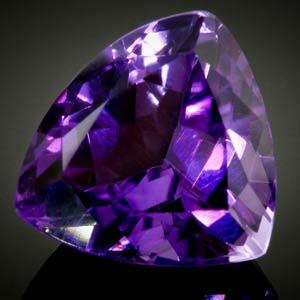 In Bolivia, the two varieties are found having grown together, providing for purple and yellow gem called Ametrine. While this gem’s color fetches a lot of interested for orange center stones, it’s important to note that like Amethyst, Citrine can scratch and dull easily. 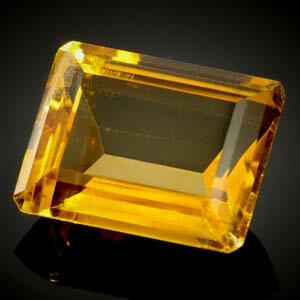 Though topaz can be found in an especially broad spectrum of color, from the prized red (imperial topaz) to yellow to purple, we find topaz with a specific Swiss-blue coloring to be the most popular choice for accents and accessories. 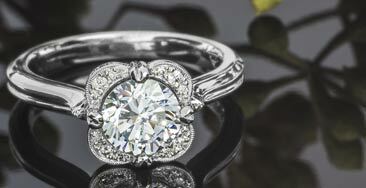 What’s more, the icy blue gem is often clean to the eye and comparative less per carat than other blue gems. 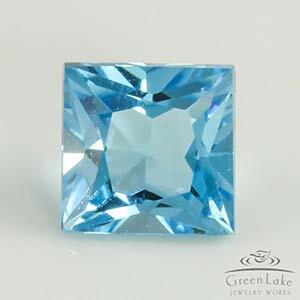 Buying Tip: Many topaz get their striking color from electro-treatments that provide only a minimal coating which can wear over time, losing color and exposing a whiter interior. Custom Gem cutting from most material. 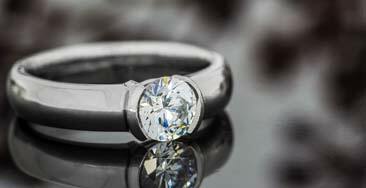 Repairing chipped or abraded gemstones. Green Lake Jewelry Works uniquely offers a wide range of gemstone cutting services, from faceting rough crystals to restoring sentimental gems and recutting poorly cut gemtones to show maximum brillilance. 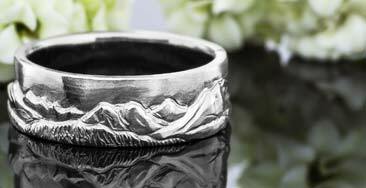 We also offer unique gemstones, gem acquisition and appraisal services & have thousands of rough & cut gems on hand. 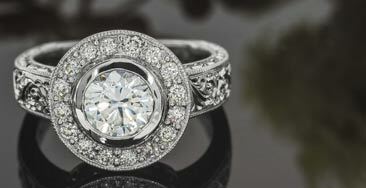 Ask a Designer for appointments or to speak to our Gem team. 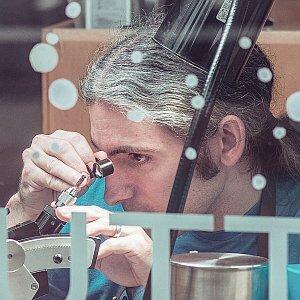 A lapidary, or artist who shapes gemstones, is a skill both as old as time and increasingly rare to find. Most gemstone cutting in the world happens in far off regions and behind closed doors, but at Green Lake it’s on full display. A visit to the studio may yield a chance to see our artists faceting rough sapphire from as near as Montana or as far away as Africa into custom shapes, right in the front window. 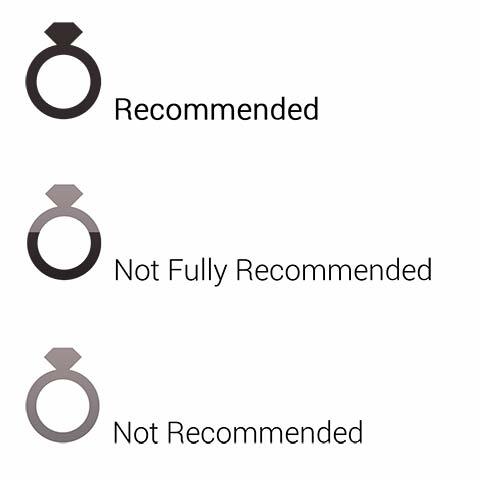 When selecting the perfect colored gemstone for your custom engagement ring, there’s a lot to consider. 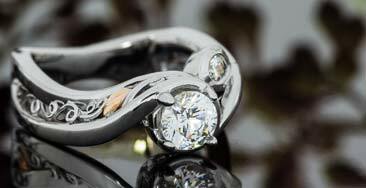 Understanding a gems color, hardness and ideal shape will aid you in your decision. 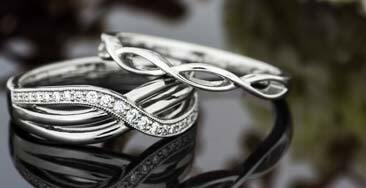 Check out our education page and buyers key to learn all the many options for bridal jewelry. 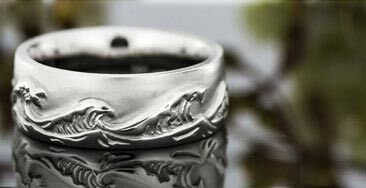 If you’ve never been into a Green Lake Jewelry Works design studio, then you might assume the company is like any other high-pressure jeweler. 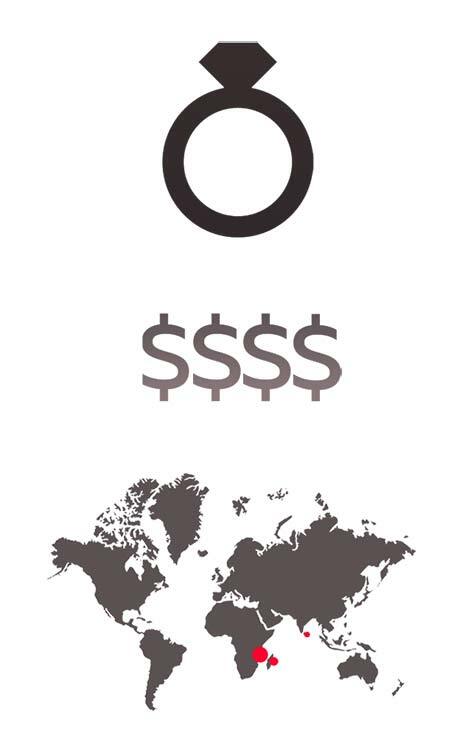 The fact is, however, we are anything but. 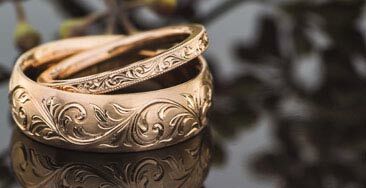 Because the core of what we do is custom made wedding rings and hand-cut gemstones from our open workshop, we’re more focused on educating clients about the materials and techniques best suited for jewelry that we can guarantee for a lifetime of wear. 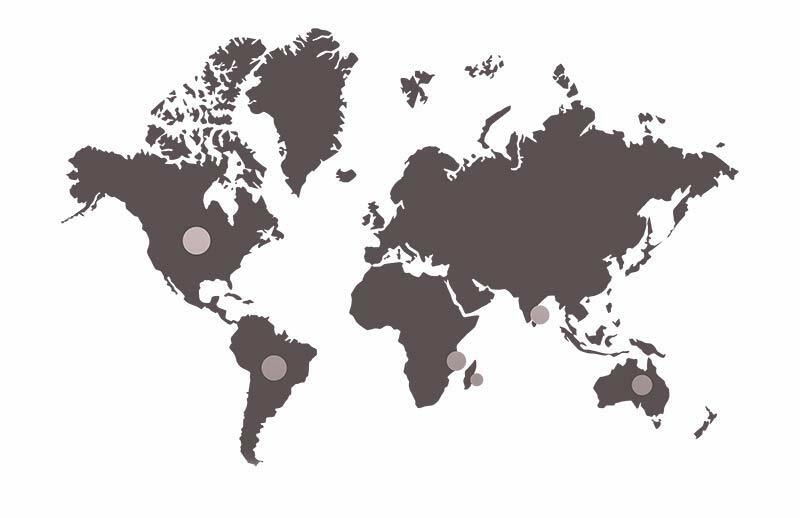 Whether you are looking to purchase your first diamond or invest in a new one, we welcome you to meet directly with our team of GIA Graduate Gemologists and Diamond Council of America certified gemstone buyers, who maintain direct relationships cutters both local and abroad. 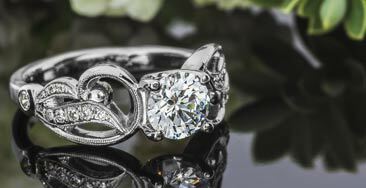 Our Artists at Work are happy to guide you toward the diamond that’s perfect for you. 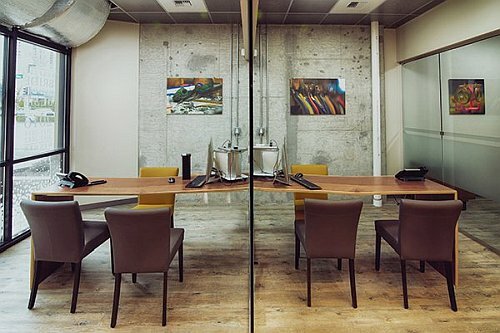 Like these pictured at Green Lake’s Bellevue studio offer tons of space and natural light to view diamonds at your convenience. 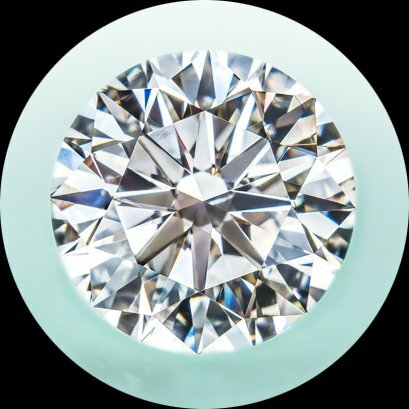 Laboratory grading tools at hand also allow you to see elements of a diamond listed on a certification that are not visible to the naked eye. 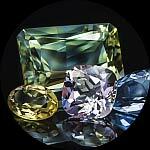 Viewing diamonds and color gems in a variety of lighting conditions helps see the true nature of each gemstone.